Blanche White is a plump, feisty, middle-aged African-American housekeeper working for the genteel rich in North Carolina. But when an employer stiffs her, and her checks bounce, she goes on the lam, hiding out as a maid for a wealthy family at their summer home. That plan goes awry when there’s a murder and Blanche becomes the prime suspect. So she’s forced to use her savvy, her sharp wit, and her old-girl network of domestic workers to discover the truth and save her own skin. Along the way, she lays bare the quirks of southern society with humor, irony, and a biting commentary that makes her one of the most memorable and original characters ever to appear in mystery fiction. 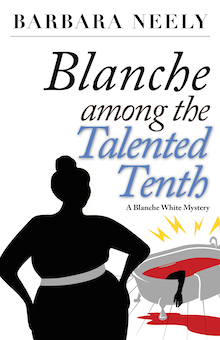 African-American maid Blanche White and her kids are invited to an elite resort for wealthy blacks and stumbles into a murder...and once again becomes an amateur sleuth, using her sharp wit and keen social insight to discover whodunit. The second mystery in the Agatha, Anthony and Macavity-award winning series.